Note: This is off topic but I just wanted to share my experience at RTA Office, Khairathabad. If you’re looking for any technical post, Please skip this one. Few days back, I went for my new bike registration to RTA Office Khairathabad, Here is the procedure. Taking Picture and Sign and some other formalities. Verifying the Chasis number and Engine number. Note: This process may be different if you go to any other RTA office. Counter numbers also differ. So please check with the help desk people. 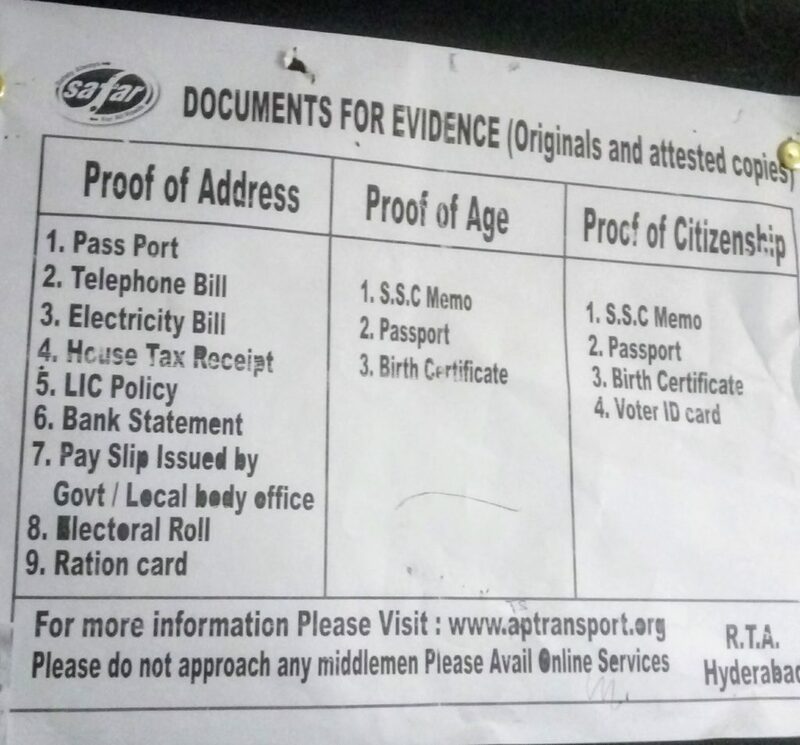 First of all, Goto the documents verification counter, If your in RTA Office Khairathabad then you need to park your vehicle at Chasis verification place. Then go to the main building of RTA office. Where you can find all counter for Learning license and Permanent license and etc. We need to go to the Second floor of that building and the Counter number is 15. ( Goto the Counter number 15 ) with all the documents. Here is the Image of the same. Your dealer already gave all documents to you, Form No 20, 21, 22, Temporary RC and Tax Receipt and Retail Invoice while purchasing the bike. So you need to keep them in order. ( Order might change according to RTO ). Pay slip issued by Local/Govt office. If you are like me, who don’t have any of them except bank statement, then you can use any Nationalized bank statement for the Address proof. But the statement needs to have Bank Stamp and sign. Take a look at the following image for more details. Once you got all documents then go to the respective Counter number, If you are in Khairathabad RTA office go to the counter number 15, The guy in the counter will check all your documents, If everything is okay, Then he will give you one receipt stating “RECEIPT FOR PAYMENT OF CASH”. Add that receipt to your documents. Now you successfully completed step 1 Documents verification. Now go to the respective counter, If you are in Khairathabad RTA then go to the Counter 18, Where they will take your picture and Fingerprint of Left-hand Thumb. They will ask you for valid ID proof, So keep one original ID proof in hand. If everything went well you will be asked to go to the next step. Now you successfully completed step 2. Then you need to go to the place where police will verify your vehicle Chasis number and Engine number. If you are in Khairathabad RTA Office, then go to the Tamarind tree where you parked the vehicle. Now you need to take the Chassis number pencil print. Then one police will check your print and Vehicle Chasis number and Engine number if all matches he will accept your application. Then he will take all your documents and also he will hand over the “RECEIPT FOR PAYMENT OF CASH” to you. Keep it safe!! Now you successfully completed all the steps. Now you need to wait for the official SMS from the High Security Registration Number Plats (HSRP) in the State of Telangana. Once you got the SMS then you need to come again to RTA Office and Fix your Number plate. If you are in RTA Khairathabad, Go to affixation center then show your SMS then they will fix your Number plate. Congrats, You successfully registered your vehicle with RTO and got your number plate. DISCLAIMER: This is my personal experience, I shared it with the motto of helping other people. So if any information provided here is not valid please let me know I will update the post according. But this is the process I went through to get my Vehicle registration. So all the details mentioned here are mostly valid. If the procedure or any steps changes please let us know in the comments or by using the following contact form. So that we can provide more accurate details to the community. Next story Generate random number in C/C++ programming language. 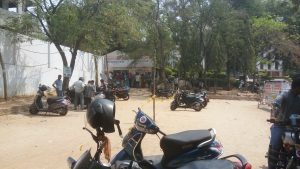 If I haven’t booked the slot and due to some emergency I need to visit the RTO tomorrow itself, Will I be entertained at the Patancheru RTO Office for 4 wheeler Permanent Registration? Need some urgent reply. can we book 11 O’clock slot on the same day at 10 O’clock. 1) yes, the process is almost the same still. Got the registration done in Kondapur, Hyderabad. everything got done in 30-40mins. Easy and smooth process. No agent required. 2) My vehicle dealer gave me tax-invoice on A4 and stamped and signed it…. 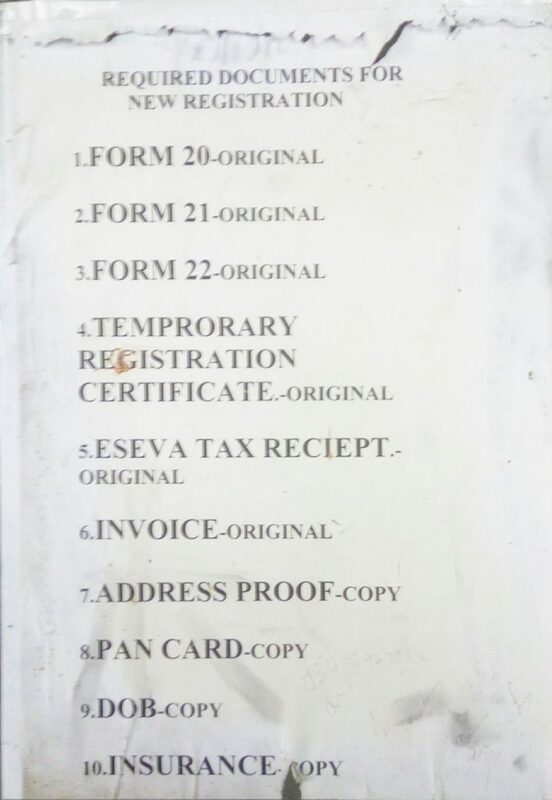 RTO guys, though accepted it, were insisting on proper printed tax-invoice , no photostat/print-out with stam-&-sign on it. is residental address proof from local IT company enough? Thanks for the wonderful info, and helping fellow Hyderabadis. Should we pay anything for fixing the number plate at HSRP centre? I think I lost the “receipt for payment of cash” which you asked to keep it safe. Where in further process is it required? I have received the hsrp message. what is the approximate time between date of registration and the day you got the sms from HSRP? Because i have been waiting since last 9 days. Hello, thanks for the detailed explanation. My question do we get any sms with permanent nunber before HSRP sms stating the number plate is ready? I registered my car at ko dapur a week back but did not get any sms till now. you will get one SMS stating your number plate is ready. HI My Name is Swaroop, I got this Message and iam under the RTA Medchal where this message is Enough or need any Card(RC) to Affix the Number Plate. Thank you Venkatesh for point by point steps in vehicle registration, it is very helpful, I recently went to Kondapur RTA, registration process hasn’t changed. When did you receive the sms after registration process?